It’s never fun when your little one is poorly. Sissyboo was never a sick child. She got a bunch of the childhood usuals – chickenpox, tonsillitis – but not that badly. OK, she usually managed to get seriously ill out of hours – why do kids always do this? – forcing us to rely on overstretched A and E services or an out-of-hours GP it takes ages to see before he or she sends you to A and E, but mostly she and we got off lightly. I’m repressing the time she got croup and nearly stopped breathing. That was terrifying. But even then one emergency steroid shot and she was running round A and E in a vest and nappy and singing nursery rhymes to random strangers. Mostly, Sissyboo’s illness involved lack of sleep, emergency work/childcare arrangements, cuddles on the sofa and books and films. It was never convenient, but ultimately bearable and the sofa time with her even felt like a bit of a luxury sometimes. Of course, that didn’t stop me worrying about her. But my sense of what constitutes worry now has been totally recalibrated. Who knew there was a whole other level of panic to experience? Not me. Not until prematurity and disability entered our lives. I’d never diminish the worries of parents who don’t have medically vulnerable children. Up until two years ago I was one of those parents and I got anxious and stressed by all manner of things. The same things wouldn’t worry me in the same way now, but my worries then were no less valid than those I harbour now. But everything’s different when your child has been through so much. When every setback has so much potential significance. You see, when premmies get poorly you don’t just have to treat the illness. You have to deal with all that came before it. A cold isn’t a cold if you’ve been on a ventilator for a while. Old scars wake up, newly agitated. As I write this at 2 in the morning, I am cuddling a wheezing Boo who has a probably mild virus but one that has agitated the damaged lining of his lungs just enough to sound like he has had an 60 a day smoking habit for 50 years. A mild virus means steroids and two inhalers and a medicine schedule so full and complex I’ve had to draw up a chart. And it’s not just the real scars that come back to life when premmies get poorly. It’s those pesky metaphorical ones too. The hurt you feel as you helplessly watch your baby fight to survive, thrive and get home. The pain that accompanies the fear that these things might not happen. The memories of hospitals, treatments, their side effects and unhappy conversations. The anxiety that hard won progress will be lost. I had planned to write a blog post about Boo’s latest developmental spurt this week. Instead, I am sat on a cold floor trying to get him to sleep and wondering if we will get away without a hospital trip this illness and counting down the minutes until I can give him the next ten puffs from an inhaler. I hope I can still write that post next week, but I don’t know how far this will have set him back. In short, when premmies get poorly you are reminded of how vulnerable your children and you are. You are reminded of how far you’ve come and how far you have to go. This entry was posted in Uncategorized and tagged childhood illness, Premature babies, RSV on November 28, 2013 by mrboosmum. OK, so call me Mrs Scrooge, but here’s my confession: I’m not really looking forward to Christmas this year. Before you pelt me with metaphorical baubles, let me explain. I’m not such a Grinch that I can’t get excited about it a little bit. Alright, a Tesco ad is never going to make me cry and Yuletide shop windows in October leave me cold. But I do love it for the kids’ sake. Sissyboo’s excitement is a wee bit infectious and some of it has rubbed off on me. And now that her birthday has been and gone I feel like I can and have to get organised. But I also don’t want to. You see a big part of me, the part of me that crosses my fingers before certain medical appointments or opening certain letters addressed ‘To the Parents of Mr Boo’, the irrational me, doesn’t want the advent calendar door on the 24th to open. I’ve had some less that perfect Christmases in the past 30 odd years but last year’s was a humdinger. Last year was also the first that I’ve ever let myself get really excited about. It had been a tough old year, to put it mildly, but after 8 1/2 months we were all together and doing well. Boo was progressing, albeit slowly, and he was home and with us. Sissyboo had settled in at school and was doing so well with all the challenges our new life had brought her. We were spending Christmas with my folks. It would be no work. No hassle. All hands on deck and more food and drink than was decent. And then Boo started to have seizures. I won’t recount the details of us discovering that he had infantile spasms – a catastrophic form of epilepsy caused by the brain damage that is the root of his at the time not diagnosed cerebral palsy. The whole sorry saga is well documented here. He had several episodes as we called them at the time on Christmas Day (not obviously seizures, but I suspected that they were nonetheless) and all I remember about Christmas Day was a crippling anxiety, a dry mouth, worry that I would ruin everyone’s Christmas if I took him to A and E and terrified to death for the consequences if I didn’t. I took him in on Boxing Day and what followed involved three hospitals, three hospital stays and some of the worst months of our lives. Boo has been seizure free for 10 months now. He was diagnosed quickly and responded well to treatment. We were and are lucky. Very, very lucky. But the spasms could come back or morph into another form of epilepsy at any point. Fear that this will happen – that he will start seizing again and lose the skills we have worked so hard to develop – resurface often in my mind, but I try to focus on the good, how long it’s been since his last seizure, how well he’s doing. Usually I don’t let it get me down. But in the long hangover from last Christmas I am struggling to think about this one. I know it’s daft. There is no more reason to think that Boo will start seizing again on December 25th this year than tomorrow or never. It’s just a date. Anniversaries are hard in Premmieland, though, as I’ve documented on the blog before. Even though they give plenty of opportunity for celebration – of how far we’ve come – they simultaneously clobber you round the back of the head and don’t just remind you but make you feel, smell, hear and taste things you don’t want to recollect. I know it’s silly but I’m frightened. Frightened of allowing myself to get too excited for this Christmas (the happy, family one we should have had last time round) and setting us up for a fall. I’m frightened that something else will come to knock the wind out of our sails. I’m frightened I won’t be able to cope if it does. I’m frightened of memories making me sad on a day when I should be happy for my kids’ sake. And I owe it to them to be strong. They deserve a fabulous Christmas. Sissyboo most of all. I am determined she will have one. So this year I am not dreaming of a white Christmas or perfect parties or anything resembling a Tesco ad. No: I’m approaching Christmas as I have learned to approach life since Boo. Call it the therapist’s approach to Christmas, if you like. My plan is to keep plugging away at the day-to-day by doing what needs to be done to give us the best chance of things working out but safe in the knowledge that things will either go to plan or not. I only have a limited control over these things no matter how hard I try. I know that now. And yet whatever happens, experience tells me that it will probably be OK. And if the determined, crazy little Boos stay true to form, it could just be marvellous after all. This entry was posted in Uncategorized and tagged Cerebral palsy, Christmas, infantile spasms on November 25, 2013 by mrboosmum. Well, how did that happen? It’s Friday again. It’s been a frantic week and it ain’t over yet. But I was determined to get a Good News Friday post out and on a Friday. Because this week we have had some especially great news. I could write a long post about it, but if you follow this blog and our tedious and upsetting battles in getting equipment for Boo, you’ll know what this means. 10 months of waiting, complaining, tears, negotiations and upset. It has been horrible. 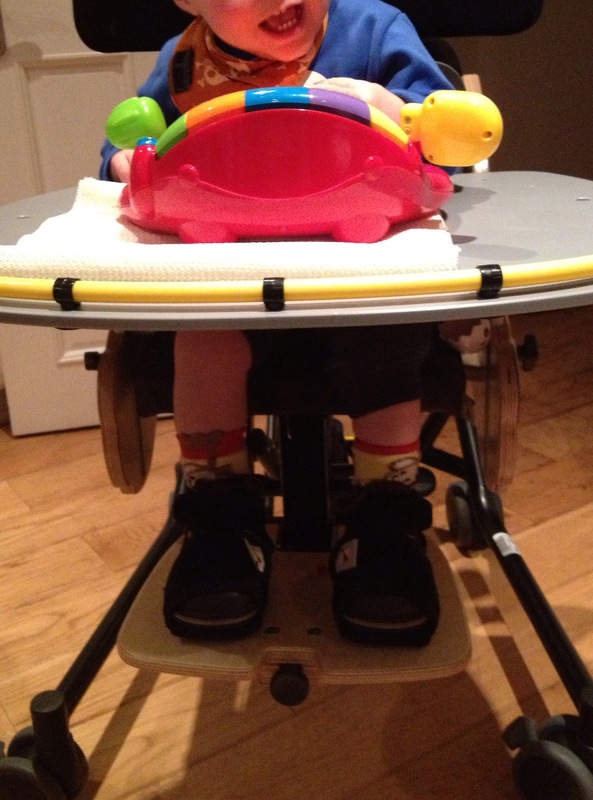 But now we are the proud users of a Jenx seating system for Boo which should see him through to age 4-5. He is comfortable and posturally sound for the first time in his 19 months of life. And he and we couldn’t Bee happier! I so hope you have some good news to share with us, too. We love to hear from you! 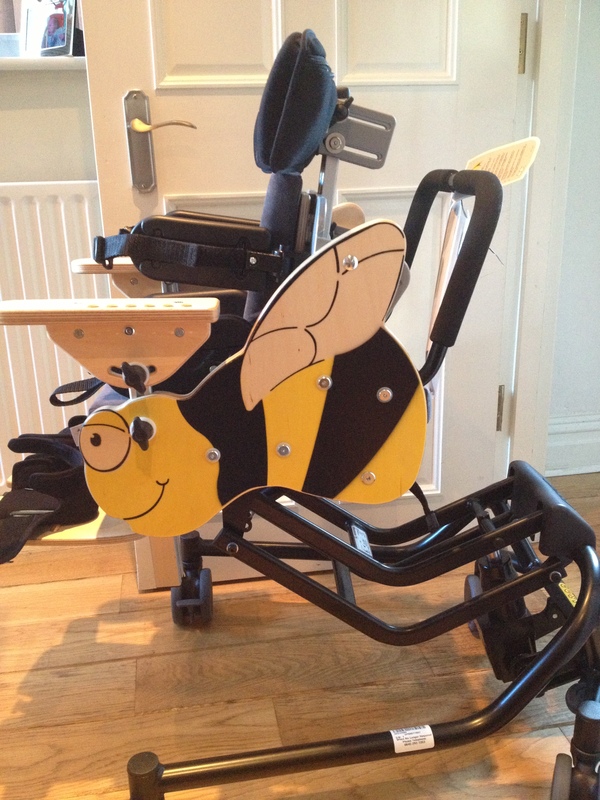 This entry was posted in Uncategorized and tagged Cerebral palsy, Jenx Bee, OT, SEN seating on November 22, 2013 by mrboosmum. Boo has been attending a conductive education nursery one morning a week for two months now. Conductive education is one of a gazillion (take it from me: I’ve counted) on the list of words I didn’t know before I had my little boy. And it’s a phrase that generates interest every time I mention it to friends, on Twitter or the blog. What is it? Does it work? Those are big questions and not easy to answer briefly, but I will attempt to do so soon in a dedicated post. You can read a little more about its principles here. For now, all you need to know is that conductive education is a highly structured routine and group based set of learning activities that are designed to encourage the cognitive and physical development of children with neurological and motor difficulties, especially (but by no means exclusively) cerebral palsy. The long-term aim is to enable children to live as independently as possible and all physical and cognitive tasks practised each session are designed to promote that, whether it’s taking your shoes and socks off, feeding yourself, brushing your hair, or getting down from the dinner table. Conductive education settings are often called Schools for Parents. The reason for that is that we have much more to learn than the kids. And we work with our own children, one-to-one, with the help of the teachers. Boo LOVES conductive education. He is sociable, and really likes all of the other 5 children in his class. (So do I. They are all amazing, funny, sweet and tenacious little people.) He also adores the teachers and would spend every minute of every session cooing, smiling and otherwise flirting with them (a good way of making sure he gets the second helpings of lunch and pudding he always manages to get) if we let him. But make no mistake. Conductive education is really hard work for him and for us. Brutally hard work, sometimes. For three hours a week, every wrist or head angle, leg or back position is monitored and corrected. There is no giving up. Boo has got used to the routine of conductive education (the same activities – with variants – come in the same order each week) and anticipates the next one now. Among his favourite tasks are the anticipation games that are played. So at different points in the session the children have to be still in any given position (they do it in lying, on their tummy and sitting), hold that position (not easy) and then listen for a ‘ready, steady’ and then anticipate whatever exciting (often movement, light and sound involved) action is going to follow, and which they then have to track. But this doesn’t happen until someone (one of the children) makes a sound, whether it’s a fully sounded ‘go’ or other excited noise. This is physio, occupational therapy and speech and language all at once. I was just about to check when I felt a force pushing my fingers away from him. Boo had stood up. He had pulled to stand using the ladder chair and was giggling as if the most hilarious thing in the world had just happened. Everyone stopped. Now normally, conductive education is quite strict. If you are doing a sitting activity, you sit, you don’t stand. But no one told him to get back down. We were all amazed. He had pulled to stand. I never thought he would be able to do this. OK, he was wibbly wobbly in his trunk. But he was standing tall and proud and he was so pleased with himself. No one was going to rain on his parade and tell him to get back down. I came home excitedly and told the Grumposaur, who was about as shocked as me. But in Boo Land, while we take every bit of progress and celebrate it we are also cautious. It doesn’t pay to get too excited here, as pride often comes before a fall. So we took the good, but told ourselves it might just have been a one off. The next week the children were being encouraged to sit still by watching bubbles. Boo would do anything for bubbles. But if you ask him to pop them with his arms or lips, well… nothing doing. But it did encourage him to sit nicely on his box with the ladder chair in front. Until the bubbles stopped. It happened again. He pulled up to stand and started roaring like a lion cub with excitement. Then he sat down and did it all over again just to show us it wasn’t a fluke. He got lots of bubbles as a reward. Boy he deserved them. I couldn’t believe it. And then just as I thought there was no breath left in my lungs I was forced to expel the very last bit. Over-excited by the sea of bubbles around his head. He let go of the ladder chair that was holding him up with one hand and reached up to pop the bubbles. Tears of disbelief and joy welled up. I still can’t believe he did it. Talk about trying to run before you can walk (or stand before you can sit in Boo’s case). Moments like these are priceless. When you have been trying to teach your son to roll back to front daily for about 16 months, trying to get him to sit for over 12 your will gets ground down no matter determined you are. But Boo’s doesn’t. He never gives up and I will never give up on him doing anything so long as he is willing and able to try it. 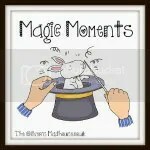 This entry was posted in Uncategorized and tagged Cerebral palsy, conductive education, SEN, Small Steps Amazing Achievements on November 21, 2013 by mrboosmum. Sunday was World Prematurity Day. It was the second since Boo was born, but the first since I have been blogging and the first one that I felt I could get involved in in my own small way. I wrote a blog post in which I tried to sum up what prematurity has meant for my family and (around Sissyboo’s 6th birthday party) tweeted, chatted online and read blog posts by others for around 16 hours. It was emotional and exhilarating, two words I didn’t really know the meaning of until having a premature baby of my own. The premature baby community – a global one – fought back against the challenges our children and families have had to face with eloquence, compassion and fierce tenacity. We learn those things from our children. The focus of my tweets and posts last week was all about what comes after pre-term birth rather than before. Because, frankly, in my experience, once you’ve had a baby born too soon pregnancy fades into obscurity. Except that is, in those vivid moments at 3.06 in the morning when they flood back. When you torment yourself by thinking did I do this? Did I do something wrong? Is it my fault my son was born at 29 weeks? Is it my fault he has cerebral palsy? Will he grow up hating me if he can never walk? I’ll come back to those moments shortly, just as my brain does, with cruel predictability on a weekly basis. Given how resolutely I try to focus on life after prematurity on the blog, I was especially grateful to be invited for a World Prematurity Day event hosted by Tommy’s and Bounty at the House of Commons yesterday which was devoted to pregnancy health. To be honest, I wasn’t sure what to expect. This is the first time that I have been invited to anything on the back of my blog. I was flattered, interested and nervous in pretty much equal measure. And then I was delighted to learn that two of the wonderful women who work for First Touch, a neonatal unit support group at St George’s in London would be there and that Jennie from Edspire, whom I’d never met, but who has been one of several bloggers who have led me by the metaphorical hand through the last 19 months would be speaking. I have a lot to learn about prematurity still and was eager to find out more to enable me to do as much as I can to help others. The focus of the event was on prematurity prevention. In particular, Tommy’s was promoting their Five Point Pregnancy Plan, which was launched two years ago and which is disseminated via Bounty to their staggering 2.5 million members. You can read more about the plan and Tommy’s work in identifying and helping vulnerable women here. But the main areas of focus are as follows: smoking cessation, eating a nutritionally adequate diet, exercising, tackling obesity and addressing mental health issues. This is not, as you’ll notice, a prematurity-specific plan. It’s about promoting healthy pregnancy for all women, whatever the outcome. It may sound like old-fashioned common sense, but this is vital information that needs to get out there. As Jane Brewin from Tommy’s noted in her speech, it is shocking to think that there are women in this country today who are struggling or otherwise unable to achieve a nutritionally balanced diet for themselves and their unborn children, but it’s no less true for that. The importance of giving women the right information so that they can make appropriate ‘lifestyle choices’ – the buzzword of the night – was made passionately and everyone in the room was, I’m sure, in agreement that empowering as many women as possible in pregnancy to make healthy choices for themselves and their children is an incredibly important initiative of which Bounty and Tommy’s are justly proud. So why did I feel so uncomfortable? Why did I have tears rising to my eyes? (I’m not a crier, by the way. It takes a lot to make me cry.) I have to answer that question in two parts, I think. The two parts of Mrboosmum need to speak. There is a good reason why things have changed so little. This is sound, sensible and now medically-verified advice that women should be heeding. But tone is important, I think. The phrase ‘lifestyle choices’ makes me bristle. In the eighteenth century the term was ‘female employments’, but it means the same thing. Women are unreflectively doing the wrong things and making the wrong choices about how to pass their time through pregnancy. The rhetoric of choice is a difficult one for me. I have never smoked. I know many women who have who have chosen not to smoke in pregnancy. I have known people take up gym memberships or opt to go on diets before trying to conceive. But is this really all about choice? For some women, eating healthily is more an act of will than a matter of preference, as Jane Brewin implicitly suggested yesterday. Diet is, of course, affected by various socioeconomic factors. They need to be targeted as much as women do. And mental health? Well, where’s the choice there except that stigmas need to be removed if women are to feel able to accept help it if and where it can be accessed. If I could have written ‘if’ in capital letters and not look like I was shouting, I would have. Mom me will never forgive myself for Boo’s premature birth. I have tried. I wrote a blog post about it and re-read it regularly. I spent 6 weeks doing cognitive behavioural therapy. But I will never forgive myself. I know that. Did I make the wrong choices? No. I was not over 40 when Boo was born (one lifestyle ‘choice’ and proven risk factor mentioned in the presentation but not part of the Plan). I took folic acid and pregnancy vitamins for months before I tried to conceive. I have never smoked and didn’t drink. I am a vegetarian of 25 years and eat healthily and well. My BMI was normal. I exercised gently but regularly, so much so that weeks after giving birth to Boo and breastfeeding I started training for a half marathon to fundraise for premature babies. I have my own mental health issues, but didn’t in pregnancy. I have prematurity to thank for them. On paper, at least, I look like a paragon of pregnancy virtue. A ‘good girl’, in eighteenth-century terms who in twenty-first-century parlance made all the right choices. But my son was born at 29 weeks in a spontaneous labour. I had had one healthy term baby before that. This shouldn’t have happened to me. To him. But it did. And I am not alone. I am one of the around 40 per cent of women who gives birth prematurely with no known cause. And I am grateful that Tommy’s funds research into prematurity because I hope that in the future they may be able to lower that shocking statistic (although us forty per cent weren’t mentioned yesterday at all). Important though the 5 Point Plan is, I was already following its advice and it didn’t help us. Neither did it help Jennie, nor my colleagues from First Touch. All of us read the books. It made no difference in our cases. And so the tears rose up in the presentations. Because this rhetoric of ‘choice’ can feel to mothers like me who made the right ones like a rhetoric of blame. I know rationally that I have no reason to feel guilty. The last time I shed real tears, lots of them, was just a few weeks ago when Boo’s cerebral palsy diagnosis was confirmed. I wasn’t crying because he has CP. I’d known that for many months before the piece of paper arrived. I didn’t cry when I saw the words ‘severe brain damage’ because I saw that damage for myself on CT scans in May of last year. The images are etched into my retina. No: I cried because the MRI scan confirmed that it wasn’t my fault. Boo’s brain injury was not sustained in pregnancy. Nor on the day he was born. I didn’t do it to him. He got an infection. In the neonatal unit. It caused the massive brain bleed. Not me. But I will feel guilt until the day I die, even though I know this is not my fault. Jennie, at several points in her wonderful speech about Esther and William yesterday, talked about her ‘failure’ to take her children to term. I nodded through the tears (this time tears of solidarity), because I share that sense of failure. I feel it daily even though my head knows I shouldn’t. Information is vital. I work in education and am passionate about it. I believe in women having choices in all aspects of their lives and access to all of the resources they need to make the best decisions for themselves and their families. And I am grateful to the work of Bounty and Tommy’s. But what I feel most passionate about today is doing more. More to raise awareness about prematurity and its many known and unknown causes. More to support other women who are about to or have already experienced premature birth. More to help them live with prematurity and whatever that brings, whether its beautiful, healthy children like Esther and William, or gorgeous babies like my Boo, who will never outgrow prematurity and will live with cerebral palsy and epilepsy for the rest of his life. I will not stop, because prematurity is not just a pregnancy issue, or something that ends with your stay in the NICU. It stays with you and your children forever. This entry was posted in Uncategorized and tagged Bounty, Cerebral palsy, pregnancy health, prematurity, Tommy's, World Prematurity Day. on November 19, 2013 by mrboosmum. Yes, Good News Friday was overlooked last week. Blame Katie Price. I was so deeply upset by her ill-judged interview with Radio 5 in which she condemned many parents of disabled children as too ‘lazy’ to access the resources they needed, that when Hayley at Downs Side Up set up a linky, well, I had to address that rather than focus on good news. But there has been some. Lots. So much, in fact, that this going to be an edited highlights and I will flesh out some of the other stuff (like what Boo’s been up to in conductive education) for other posts next week. My fabulous no-so-little girl turned 6 this week. It’s been a week of celebrations, with presents and a family tea with just us four Boos on Wednesday, veggie hotdogs and cheesecake (not all at once, you understand) and a party with a few school friends tomorrow and grandparents and the little Boo’s favourite female other than Mummy, my sister. She really is in a good place at the moment in terms of Boo and the way she wanted to share him in all her birthday fun (getting him to help unwrap presents and blow out the candles – two things that are very difficult for him), well, let’s just say it made my day. Well, I leave you hanging on what’s going on with Boo at conductive education. 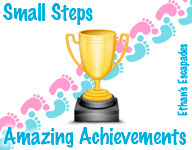 One for Small Steps Amazing Achievements next week, I think. But things are slowly coming together with equipment. His standing frame unexpectedly arrived about an hour ago. And after nearly breaking my back to get it into the kitchen, it’s all ready to set up. Even more exciting, his chair arrives next Tuesday and after many months, our wheelchair services referral came through for him to be assessed for an adapted buggy. All of these things will greatly improve his life and ability to be included in games, meals and things most of take for granted. It has been a real battle, but it’s coming together. OK, so first a post of mine in support of Home-Start’s fabulous Snowflake Appeal got put on the Good Housekeeping website, and tweeted about by Kirstie Allsop. Then I won a blogging competition! I am still gobsmacked about it. 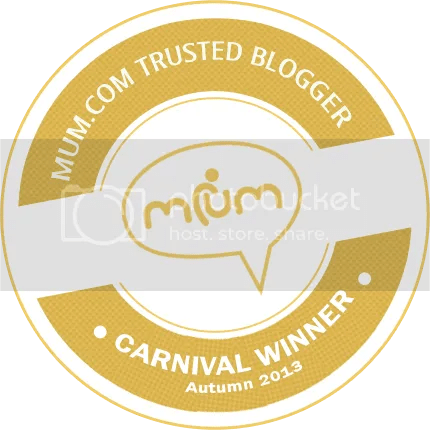 I am very proud to be a member of the Mum Network Trusted Bloggers Club and a few weeks ago I entered an autumn carnival on the theme of ‘The Juggle of Modern Motherhood’, where I wrote about a day in my life. It was an entirely real day. The carnival had some amazing entries and the fact I won (and won a ticket to Britmums Live) is just astonishing to me. Now I just have to work out how being a secret/anonymous blogger works with attending a blogging conference. Answers on a postcard please. OK, over to you. I’d love to hear your good news this week. And please, this weekend, do spare a thought or any pennies you have for any of the leading charities working to prevent pre-term birth or fund special care for some of the 15 million children born too soon across the world every year. This entry was posted in Uncategorized and tagged blogging competition, Britmums Live, Cerebral palsy, Good News Friday, Homestart, Mum Network, Snowflake Appeal, World Prematurity Day. on November 15, 2013 by mrboosmum. I don’t mean technically. You probably know that prematurity is clinically defined as birth before 37 weeks gestation. You may also know that 15 million children are born too soon every year, 60,000 of which are born in the UK alone. But parents of premature babies (though, in my experience, they frequently cling to statistics) know that facts and figures don’t mean all that much when it’s your child who has been delivered in a pre-term birth. If you are quoted an 80-90 per cent survival rate for your child (as we were) and, unimaginably, they are one of the 10-20 per cent who die, or if you are given a 70-80 per cent chance that your child would outgrow their prematurity (as we were) and they don’t (as Boo can’t), well let’s just say that statistics don’t mean a thing. Prematurity is despair that runs so deep that you feel you can plunge no further. Prematurity is hope that makes you fly so high that you can barely breathe with the excitement it generates. Prematurity is pain and joy. It is death and it is life. It brings into focus what it’s all about. What really matters. And once you have experienced this, nothing will ever be the same again. You see, prematutiry is like The Matrix. I never thought I would be the one this happened to. And there are moments – who am I kidding, I mean days – when I wish Morpheus would enter my life with his funky shades and offer me a blue pill so that I could forget about it all. So that I could go back to my happy, pre-NICU existence, where I just got on with the job of looking after my kids and going to work and socialising. This life tastes bad sometimes. There have been days that have felt stiflingly grey, when I have longed to breathe fresh air and taste the pleasures of my former life. Days when I have been scared out of my wits by things I hadn’t ever known about before: about long lines and lumbar punctures; about brain bleeds and cerebral palsy. I rather liked the normal world that was pulled over my eyes for the first 35 years of my existence. But of course, I had no idea how bloody lucky I was at the time. I can’t go back. This is my new reality, a reality that is structured as much by prematurity as it is by the passing of the seasons and the days of the week. It is everywhere in my family’s life, even though we left the NICU well over a year ago. But this is only part of our story. This is only part of what prematurity is. Because prematurity is also jaw-droppingly revelatory. It opens your eyes to a world that was always there, but (in my case) you never really knew existed. And it’s a challenging world, to be sure. It’s a difficult world. Yet it is also an astonishingly beautiful place in which the truth about life, about why it is so very precious, is revealed. How could you ever appreciate a finely cooked steak if you haven’t tried to digest the indigestible? Ignorance is not bliss. It’s only when everything you hold dear is on the line that can you appreciate it. I mean really appreciate it. There is no blue pill for me. But if I were offered it, I wouldn’t take it even if I would give my soul for my son not to have cerebral palsy. You see, prematurity is the scales falling from your eyes. It’s seeing what makes the world turn on its axis. And once you’ve had a glimpse of this reality and seen it for what it is, you see everything differently and you bat away all the trivial stuff that preoccupied you before the NICU like a fly to the swat. Because none of that is real in the same way. I can see that now. Prematurity affects the lives of millions of families across the world every year. On World Prematurity Day, please consider giving a donation, or volunteering some of your time, to one of the leading charities (such as Bliss, Tommy’s or Bounty) that fund research into pre-term birth or who offer invaluable support and care for families affected by this life-changing event. This entry was posted in Uncategorized and tagged Bliss, Bounty, Cerebral palsy, pre-term birth, prematurity, The Matrix, Tommy's, World Prematurity Day. on November 12, 2013 by mrboosmum.